A Virtual Private Network (VPN) is a network technology that develops a secure online connection over both private networks as well as the entire Internet, allowing users to access websites that are normally restricted or blocked for different reasons. Multinational companies, educational institutions (for research purposes) and federal governments utilize VPN systems to enable remote users to conveniently access a private network. With the spread of VPN services for personal use, more and more individuals use VPN to unblock websites on their home computers, laptops and mobile devices, as well as for secure online browsing and bypassing Internet censorship and geolocation restrictions, by changing their IP address to the IP in the location of a VPN server. Their Internet connection becomes secure through military-strong encryption and their browsing is unrestricted through access to hundreds of IPs around the world. What Countries have banned the Use of VPN? VPN is typically banned in countries that have authoritative laws, such as China, North Korea and Iran. With limited access to a majority of online content, in order to unblock blocked websites, citizens, tourists and expats in those countries typically resort to the use of proxy servers and VPN to unblock websites. Below is the list of the top 10 Internet censors around the world. Why have these countries made VPN usage illegal? Some countries have banned the use of Virtual Private Networks so that they can maintain a bird’s eye view on all online movement made by their citizens, who the governments of these countries consider as nonconformists, as well as to control the information their citizens have access to by censoring websites with liberal or opposing views. VPNs allow to bypass censorship and keep all online activities confidential. Is Facebook Blocked in China? Yes, Facebook is blocked in China. China has its own social media network that the Chinese government can monitor and control, and they consistently encourage their citizens to use their local network vs. US-born and independent Facebook. However, you can still unblock Facebook in China with a VPN. Learn more about the use of VPN for social media and about the internet censorship in China. If you are still wondering which VPN to use in China – Le VPN is your answer. Why do I need to subscribe to a VPN before I arrive to a censored country? VPNs are banned in most countries that practice Internet censorship like China, which means if you visit those countries without purchasing a VPN, you won’t be able to subscribe and download it from that country. However, if you install a VPN before visiting the country, you will still be able to use it and unblock websites wherever you are. Is Having a VPN Beneficial for People Living in Countries that have Blocked Access to VPNs? Moreover, if you are a student and want to access certain websites for your research, you can use a VPN. Similarly, businesses use VPNs all the time to promote their products and services and further their marketing campaigns. This is why it is so important to subscribe to a VPN service to unblock websites. How do I get a VPN to unblock websites? This is a good question. Instead of using temporary proxy servers and free VPN services that are not secure and substantially lower your internet speeds when you unblock websites, it is wiser to buy a subscription to a trustworthy and fast VPN service like Le VPN. 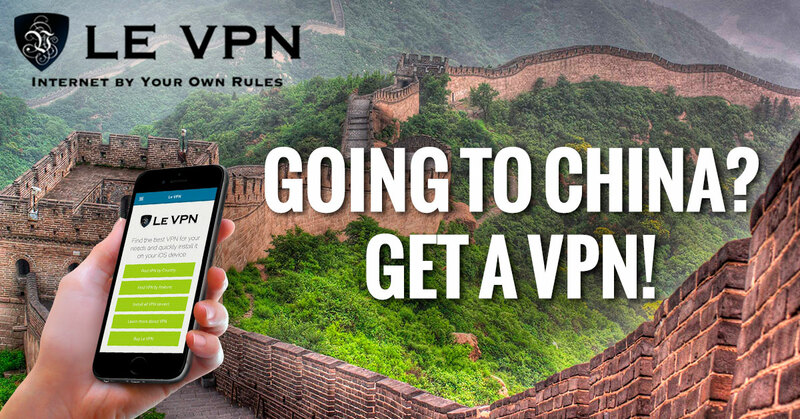 Check out our plans and pricing today, and use the Internet by Your Own Rules with Le VPN! Good day, our country block my favorit 888.com , Can get here VPN with Latvian IP who let me in ? Because 888.com have rules about login of location IP ??? Hi Martins! Yes, Le VPN has servers in Latvia which means that you can access the Internet with a Latvian IP as if you were really based in Latvia. As a student in Africa is it a crime if I use another city outside Africa as my location? Hello Agbesi, we are not sure what the laws in Africa are, but in other countries it is absolutely legal to change an IP address to another city or another country. If sites that are BLOCKED, CAN be ACCESSED USING VPN than whats the POINT of BLOCKING them. Can a COUNTRY NOT block the VPN services too????? As a tourist, I would be very hesitant to use a VPN service in China. The government there is big enough to have people looking into foreigners and would be willing to classify it as spying. I wouldn’t be willing to risk my freedom if I were going to be there for just a week or 3.